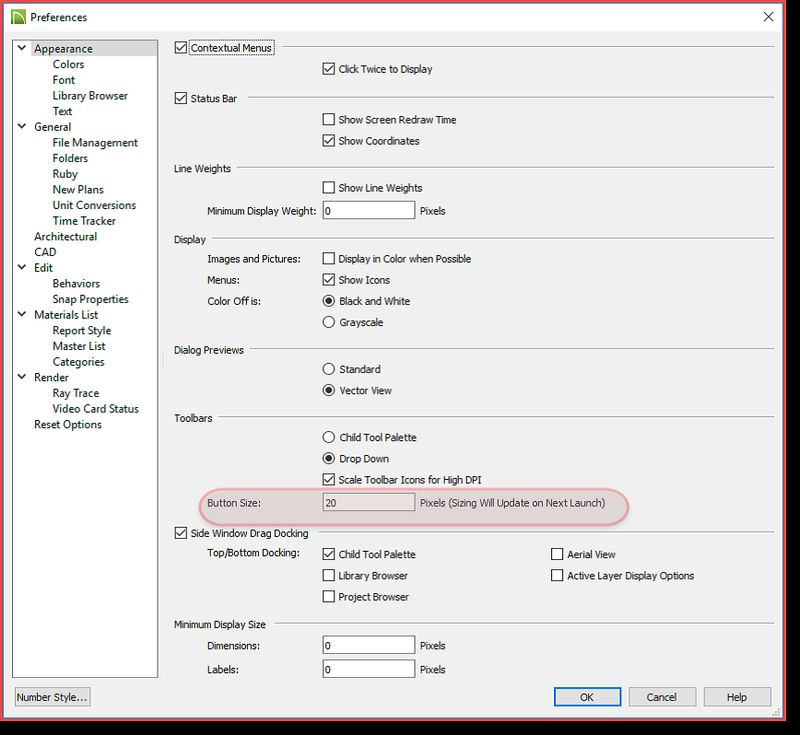 Preference settings control how Chief Architect acts and the way the interface looks. For example, in Chief Architect X9, you can now control the size of the tool buttons in the tool bars, using a preference setting. ADJUSTING THE SIZE OF TOOL BUTTONS. 1. If you have Chief Architect running select File ► New Plan. If the program is not running, then go ahead and start Chief Architect and select New Plan from the Welcome to Chief Architect splash screen. 2. Click the Preferences tool button (or select Edit ⇒ Preferences). The Preferences dialog displays. You should be on the Appearance panel. In the Toolbars section you can change the size using the Button Size edit window. 3. Change the Button Size value to 40. Click OK. An Information dialog displays letting you know that the toolbar buttons will be resized when you re-launch Chief Architect. Click OK.
4. Close Chief Architect. Re-start Chief Architect and select New Plan from the Welcome to Chief Architect splash screen. 5. Note that the tool buttons are now much larger. Some of the toolbars may extend beyond the screen, depending on the size of your monitor. If any do, you will see double arrow. 6. If you see a double arrow, click on it to see the entire toolbar. You may want to try different tool button size values to see which one works best for your situation. When you open Chief Architect X9 for the first time the default value is 20, which seems to work out best for most users. If you have a larger monitor you may find that a larger value will work better for you. If you like this tip, you can find more handy ways to improve your 3D home design software skills by picking up your Chief Architect X9 training book at ChiefApprentice.com.